My notice of forced labor assigned me to Salamander A.-G., Reparatur-Betrieb, Berlin SO 36, Köpenicker Str. 6a–7. 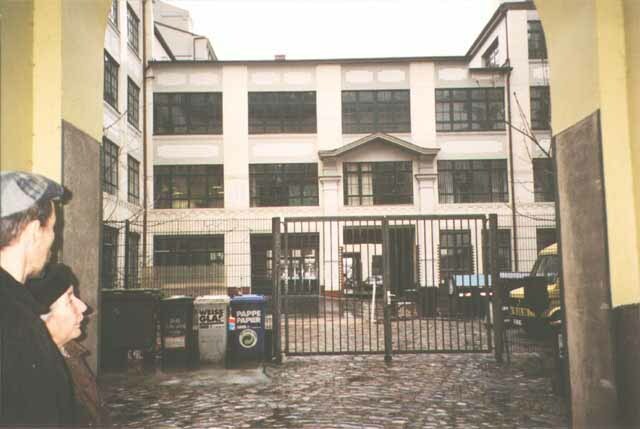 From now on I spent my days in a factory located in a backyard near Warschauer Brücke. I stood in front of heavy barrows with iron wheels which looked like plump shelves. They were used to transport shoes back and forth between workers in the hall. The barrows were pushed to me from the left, loaded with worn out, crushed, and sweaty shoes. They were in need of repair, and I had to check which repair was to be done. I had to examine the shoes, determine their damage and sort the pairs into other barrows: to be stitched, glued, resoled, and so on. When a barrow was full I wheeled it to where the shoes were stitched, glued, or nailed. A woman was in charge of the right-hand aisle. She always carried a bendable stick to point to damaged shoes without having to touch them. She carried the stick like a tamer carried his whip. The overseers were members of the SS, as was the woman in charge of the right-hand aisle. They watched us and made sure that we did not do anything but work. “Us” were Polish shoemakers, women from Serbia, French workers, Jewish women, girls like Hannchen and me. Nobody was allowed to talk to anybody. If one was required to stand, nothing was permitted but to stand. If one was required to sit, nothing was permitted but to sit. We did not fear being beaten with the stick, but the threat of being sent to a concentration camp was always palpable – that is what had happened to the girl who had checked the shoes and wheeled the barrows here before me. The SS hag had come up with something for us: Above the stitching at the heel, many shoes had a leather strip attached by stitching which came loose after long wear. If this was the case, it was glued on again using a glue called “Ago”. I had to check whether or not the stitched seam still held tight. To check this, a tool was usually used which looked like a broken knife. I thought the overseer would give me the tool. “Go! Begin!” – “With what?”, I asked. “Don't you have fingernails?” So I slid a fingernail under a leather strip and checked its tightness. “I told you so! You follow good.” After a few hours I realized the trick to doing it. When I sensed that my fingernails were rubbed and the skin broke and became sore, I changed fingers and gave the sorest ones a rest. I changed fingers too quickly, so that all became infected. Then I came up with a new plan: I used only one finger a day. I lasted three days, before I – again – switched fingers too quickly. Shortly after the white of the nails became damaged, the skin swelled, broke, got infected and began to fester. My fingertips were a bloated mess. Nearly all shoemakers in the workshop were Poles. One of them, Jacek, pushed the barrows to me, when a new batch came or when the repairs had been done: the barrows with the Ago glued shoes from the workers close to the stairs as well as from other places of the workshop. Jacek hadn't talked to me much yet. Only on my first day. “I'm Jacek. And you?” – “Vera.” Jacek was guarded. Not due to the speech interdiction. He was suspicious of me. Shortly after Hannchen and I stood in front of the SS officer, Jacek asked while pushing the barrow to me: “Why are you here?” – “I'm assigned.” That likely didn't mean a thing to him. When he brought the next barrow, he asked again: “Why are you here?” – “Because I'm a half-Jew.” – “I don't understand. Jew or not Jew? What's half Jew?” – “My mother is a Jew. My father is a Christian.” – He couldn't stay any longer, the overseer came closer. But with the next barrow he asked another question: “You – German?” – “Yes.” And again: “But why are you here?” How I could explain to Jacek why I was there? I didn't understand it myself. But Jacek said when he came back: “I understand.” Now I have a question: “Do you believe me, Jacek?” – “Yes.” – “Because of earlier, below the stairs?” – “No. Because ... your hands. And you are frightened, the other girl too.” In this manner I talked to Jacek, the Polish shoemaker, more than a month. We conducted serialized short dialogues. If it hadn't been for Jacek, I'd have used the thin layer of horny skin of my fingers again to slide them under the leather strips. The first thing he said to me the next morning was: “My friends say: All shoes with leather strips go to the Ago glue station. Do you understand?” – “No examination? All shoes straight onto the Ago barrows?” – “Right. Hands must heal.” When Jacek brought the next barrow the dialogue was very short: “Thanks, Jacek.” He only nodded. “Vera, when they are coming to get us, are we going to stay close together?” I hugged Hannchen. It felt good to touch somebody. “If we can't go home anymore, that'll be hard, Hannchen. Now, out in the cold, digging out trenches. We have to think of something.” – “From tomorrow on we'll put on double layers of everything, stockings, shirt, underpants. And into the bag that we must hand in downstairs we put a sweater and things we absolutely need.” – “Curd soap and something to sew.” – “As long as we'll stay together”, Hannchen closed the conversation. The only recovery was the lunch break. We got warm soup with potatoes or noodles. The soup and the tramway ticket were our pay. Each day at lunchtime we went into a room which was set up as a canteen. Still, we could sit on benches and put our bowls onto tables. Here, we, the Germans, were allowed to talk amongst ourselves. But it was forbidden for us to speak to the men and women who were marked as “OST-Arbeiter” with a patch on their jacket. We reached the canteen through a windowless hallway. The hallway had two dark niches closely guarded by the SS men. In those niches, Soviet prisoners sat on the floor. They were lead into the niches before we passed the hallway, and they were still there when we returned to the hall. There they sat and ate potatoes boiled in their skin. They each had a handful of it, nothing else. The same day after day. They ate the potatoes with peel, and I only wished that the potatoes at least had been hot. At least we had the canteen with tables, benches and windows, with bowls and spoons. We passed those men and knew nothing about them. They weren't let out of sight. I never found out what or where they worked at Salamander. To whom did the shoes at Salamander actually belong? There just had to be a great many naive people who gave their shoes – in this period a precious possession – to a repair service and reckon that they get them back, repaired. And where were Salamander's counters? People who gave their loafers to have them repaired seemed to have no special wishes. And the people who served them handled the shoes very carelessly. They marked no shoe, not one was tagged with a number, a label, or a stamp, although the shoes had to be transported through the entire city and back, since their owners would have get them back again. Where were these customers? Where did the shoes come from and where were they sent to? This day and age, decades later, someone may buy Salamander shoes. I, for one, that's certain, won't wear shoes with this name. If I hear this name, I have to remember the shoes without owners. It's not true that time is the great healer. The text is a shortened form of the chapter »Salamander« from the book »Späte Notizen« (Late Notes), Verlag Neues Leben, Berlin 1982 – published in 1998 at Agimos-Verlag Kiel and in 2008 at Trafo-Verlag Berlin with the title »Man kann nicht eine halbe Jüdin sein« (It's Impossible to be Half a Jew). Through the entire war Vera Friedländer (71) worried about herself and her family. Her mother was a Jew, her father a Christian. But while her father has been put in a prison camp her mother remained undisturbed. Until now she doesn't know why. 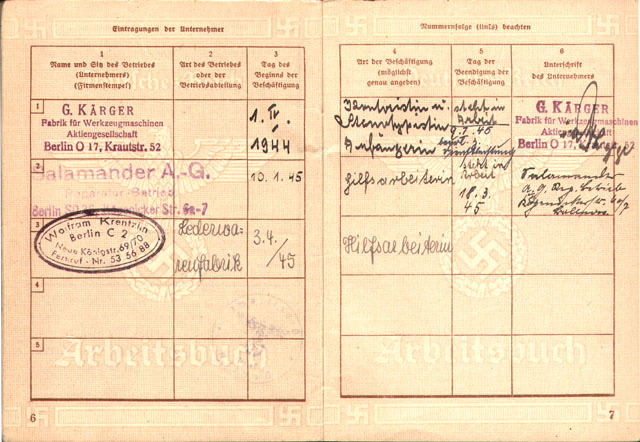 She assumes that a resistance group in the Berlin employment office for Jews walked off with her mother's registration card. 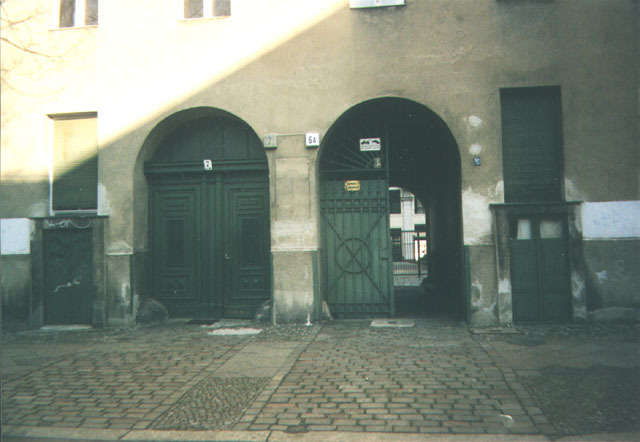 For a while Vera Friedländer worked – voluntarily and paid – as a shorthand typist at an arms manufacturer until early in 1945 when her boss received the notice of forced labor which assigned her as an unpaid, unskilled worker to the repair service of Salamander A.-G. at Köpenicker Straße. There – Friedländer reports – she worked “together with 50 to 60 people”, Polish shoemakers, Frenchmen, Serbian and Jewish women – until March 18th, 1945, when the building had been partly destroyed by a bomb. Afterwards she was assigned to a leather factory. All these stages are documented in her job placement book. After the war, Vera Friedländer began to work in the GDR first as an editor and later on as a professor for linguistics at the Humboldt University. When she tried to make an application for acceptance as a Victim of Fascism, she was told at the office: “Why? Nothing has happened to you.” Since 1990 she receives a small pension as a “racially haunted”. Today Vera Friedländer is head of a language school in Berlin. Some time ago, she again visited the rooms of the former repair service at Köpenicker Straße in Berlin-Kreuzberg. What the bombs spared exists to this very day. Most of the rooms are empty. When she expands her language school, she would like to rent those rooms and affix an identification plate at the entrance as a reminder of the past, and so that Salamander can no longer deny that this repair service had ever existed. Do we need Salamander shoes? Salamander doesn't know a thing. The corporate group passes enquiries directly to the historian Hanspeter Sturm who edited the Salamander history with the sugar-coated title “Sie hatten schützende Hände” (They had protective hands). Here, he describes the commendable behaviour of the corporate management during the Nazi time: “All Jews who were employed with Salamander before the war could begin again after the war.“ He says that thanks to the “protective hands” of president Alex Haffner, no Jew had perished, the corporate group only employed 284 French prisoners of war as forced laborers, and that otherwise there had been only so-called contract workers from France and Greece who had been paid, as were their German colleagues. About the repair service decribed by Vera Friedländer in her autobiographical report, the historian knows nothing. “Salamander shoes don't need repair”, he laughs. Also the press relations officer Elvira Saverschek never heard about it. 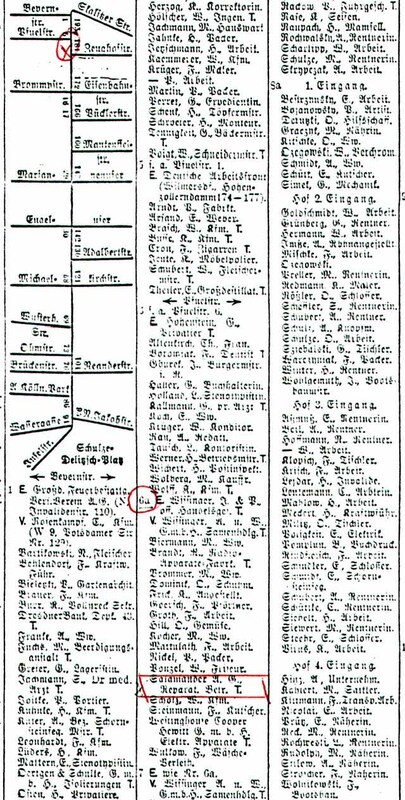 She researched in the land register and declared: “There has never been corporate property at Köpenicker Straße.” That's right. 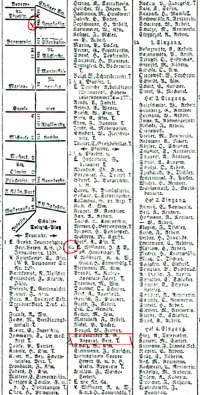 But a Berlin address book from 1937 indicates Salamander A. G. as the licensee of a repair service at Köpenicker Straße 6a. And Vera Friedländer also retained her job placement book. The address above is clearly legible in the Salamander stamp. “Travelling to Kornwestheim wasn’t easy. I had to force myself to do it”, Vera Friedländer says. As a young woman, the 83-year-old had been a forced laborer at a Salamander repair service in Berlin. 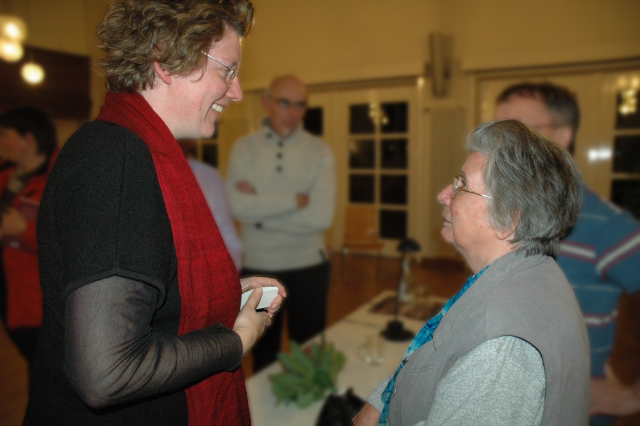 Invited by the Protestant Church in Kornwestheim, she now spoke about her experiences. More than 60 years after the injustice, approximately 80 women, men and teenager at the Protestant John Parish Hall – many from the religious community, some from the historical society, along with Walter Habenicht and Friedhelm Hoffmann, the only two from the church council, and only town archivist Natascha Richter from the local government – listened to Vera Friedländer’s account of her suffering during her time at the repair service at Kopenicker Straße 6a–7 in Berlin. The repair service that the company denies even existed, had been listed in the Berlin phone books in the 1930s and 40s. The company’s denial continues even though Vera Friedländer’s job placement book shows the stamp of »Salamander A.-G.«, and in the face of evidence that Salamander even had company-owned camps for its forced laborers. As the daughter of a Jewish mother and a religious Catholic father, Ms. Friedländer was nevertheless required to do forced labor, although thanks to her father, she was not sent to a concentration camp. Despite the pressure from the Nazis, he refused to divorce his wife. He accepted, instead, being deported to a work camp. “In doing so, 3000 upright men in Berlin saved their families’ lives. Their relatives enjoyed a certain degree of protection. If my father had divorced my mother, we would all have been lost.” Lost like 24 of her 27 relatives who were killed during the Third Reich. Little Bella, for example, shown in Vera Friedländer’s arms in a 1942 photograph on the cover of her autobiography, “It’s Impossible to be Half a Jew.” Bella with a plaid dress and curly hair, a shy two year old in the photo, died in January 1943 in the gas chambers of Auschwitz. “It is not the fact that I had to do forced labor that impels me to mention Salamander again and again,” says Vera Friedländer. “The shoes are the reason why.” With respect to all the shoes that had been repaired in the repair service, Vera Friedländer had wondered for a long time where those shoes actually came from. After reading Anne Sudrow’s book, »Der Schuh im Nationalsozialismus« (The Shoe in the Nazi Era), she is certain, she says quietly that “a large number of them were shoes from the deportees, shoes from the concentration camps, a precious commodity at the time.” After repair, they were either distributed to people who had been bombed out, or to people who had been settled in the occupied territories, or were sold to German industrial and agricultural enterprises. Gentle in tone, but clear and concise on the matter, Vera Friedländer takes apart Salamander’s later version of the company’s history during the Third Reich. The corporate historian, Hanspeter Sturm, attested to the company’s “flawless clean record,” although between 1933 and 1945 Salamander had developed into the leading shoe manufacturer during the Reich. The company chronicle attributes the success to the “skillful political and economic tactics of the Director General Haffner.” It wasn’t mentioned that this success came, in large measure, from the quick adaptation to the Nazi regime, from the urgent and systematic “Aryanization” process, from the exploitation of cheap forced laborers and from the murderous experiments on humans on the shoe test track at the Sachsenhausen concentration camp. It is a goal of the 9th November working group to present life and suffering true stories of the previous generation, says Isolde Gneiting-Tränkle, the host. And the Rev. Fraukelind Braun gratefully thanked Vera Friedländer by saying that “you did come into this city, which is connected so much with the name Salamander” and the difficult memories you bear. The Nazis had already coined this word before 1933 in order to win over the masses who imagined that socialism was something worth striving for. They promised them a national socialism. That was fraud. For the nation led them into war, and they fought socialism. Unfortunately, today almost everyone in our country uses this word as if it were socially prescribed. I call the system of Nazi rule the word that is internationally customary: fascism, German fascism. All peoples around us call it fascism. Only here in Germany is this lying, demagogic word “National Socialism” („Nationalsozialismus“) used. I find that very regrettable. Disclaimer: This site contains links to third-party web sites. An influence whatsoever on the information on these sites isn’t possible and thus any guarantee for their correctness isn’t acceptable. The content of such web sites is the responsibility of the respective owners. At the time third-party web sites were linked to this one, no grounds whatsoever of any likely contravention of the law were found. If becoming aware that a link violates the law it will be promptly deleted.